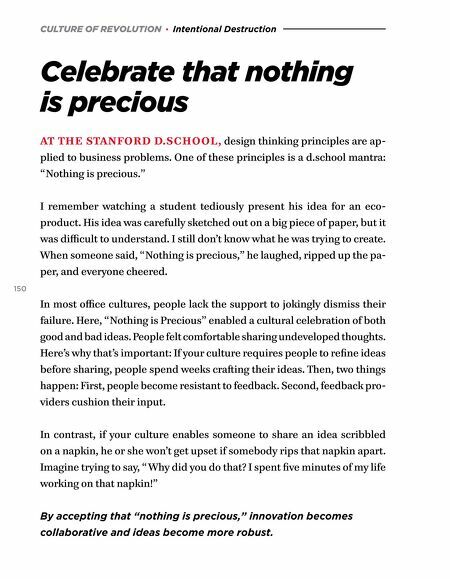 CULTURE OF REVOLUTION · Intentional Destruction Celebrate that nothing is precious AT THE STANFORD D.SCHOOL, design thinking principles are ap- plied to business problems. One of these principles is a d.school mantra: "Nothing is precious." I remember watching a student tediously present his idea for an eco- product. His idea was carefully sketched out on a big piece of paper, but it was difficult to understand. I still don't know what he was trying to create. When someone said, "Nothing is precious," he laughed, ripped up the pa- per, and everyone cheered. 150 In most office cultures, people lack the support to jokingly dismiss their failure. Here, "Nothing is Precious" enabled a cultural celebration of both good and bad ideas. People felt comfortable sharing undeveloped thoughts. Here's why that's important: If your culture requires people to refine ideas before sharing, people spend weeks craſting their ideas. Then, two things happen: First, people become resistant to feedback. Second, feedback pro- viders cushion their input. In contrast, if your culture enables someone to share an idea scribbled on a napkin, he or she won't get upset if somebody rips that napkin apart. Imagine trying to say, "Why did you do that? I spent five minutes of my life working on that napkin!" 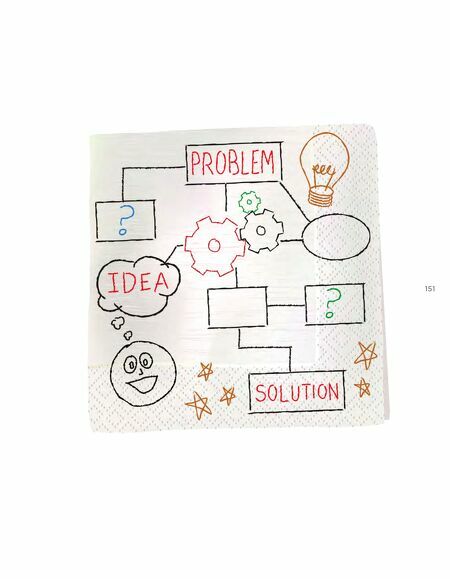 By accepting that "nothing is precious," innovation becomes collaborative and ideas become more robust.